We only saw them one time while checking in and they were very pleasant. Everything was perfect. The second we walked in, we were so happy. It was very clean and the decorations were very nice. 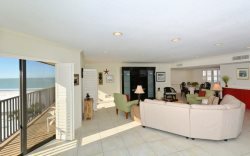 The location is perfect because you are just steps from the beach and the pool. And the size was perfect for us as well.